Lupin realizes this Lupin Game is meant to turn everyone into spies for the cops, so he decides to steal an electric car. 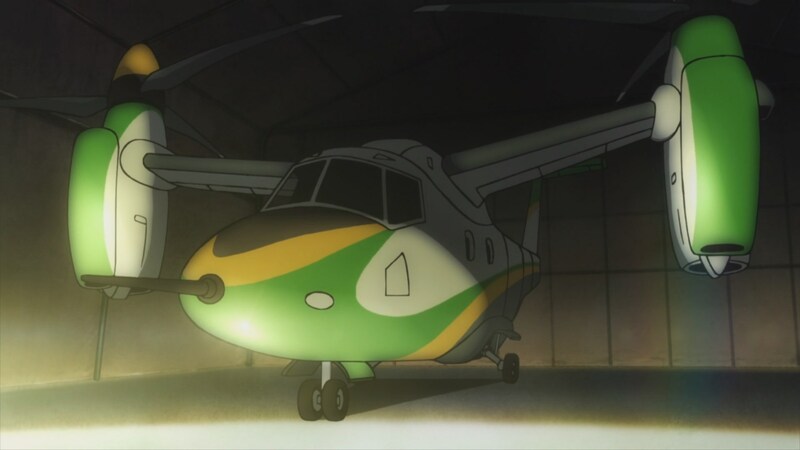 Lupin eludes Zenigata long enough to get to a hanger where an AW609 vertical takeoff airplane resides. Zenigata thinks he has Lupin, but Lupin uses the electric car’s battery to get the airplane started and off. They fly the plane until they crash it, where the gang then holes up in a small, rural hotel and make nabe for dinner. Lupin remarks on how popular the Lupin Game has become. 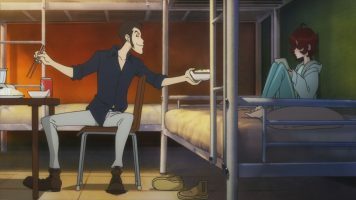 Later, Lupin and company are on a cruise ship, where Lupin uses the game to post his activities. Zenigata’s ICPO assistant, Yata, is frustrated that Zenigata won’t go after Lupin. As such, Zenigata has to point out that the cruise ship is heading for Bwanda, a nation with no treaty with ICPO. 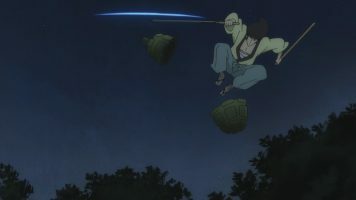 Lupin’s actions cause irritation to some members of Marco Polo. 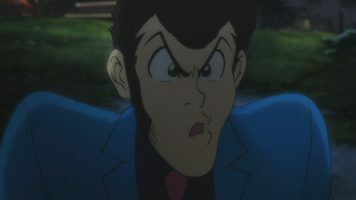 This causes Marco Polo to hire assassins to try to take Lupin out, especially since Lupin’s actions have caused the game’s popularity to wane heavily. 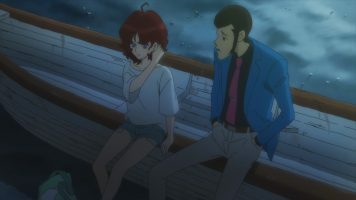 Lupin discovers Ami has run away after completing her part of the bargain for Lupin. As she wanders the back allies of the town they are in, she runs into shady characters who are keen to take her away for sexual exploits. Lupin arrives to rescue her and schools the punks in the process. He and Ami then have a chat, where she asks why Lupin wants her around, since their business is concluded. 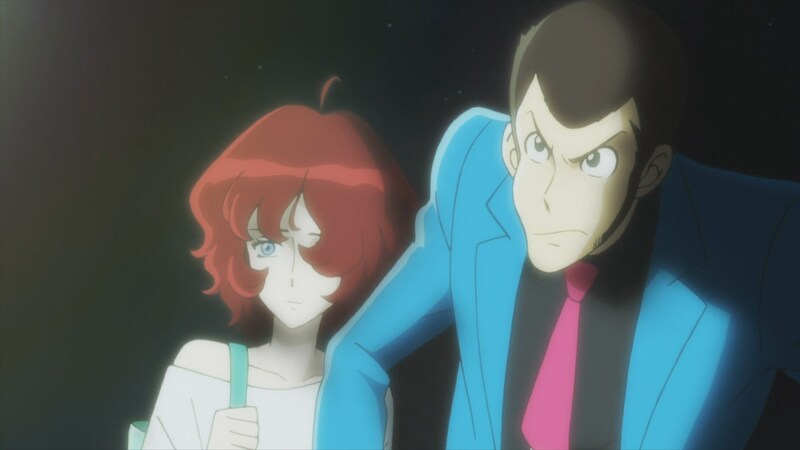 Her research and logic leads her to the conclusion that Lupin is protecting her. 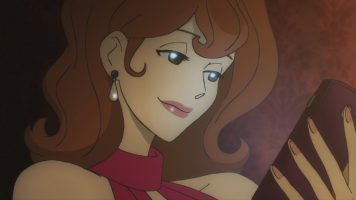 Lupin is forced to admit that he wants to keep her safe until the business with Marco Polo dies down. Assassins interrupt their conversation, and when Lupin discovers the identity of one of them, he knows he’s in for a rough. Elsewhere, Goemon finds himself battling a hitman who uses a fishing pole and line as well as a blonde woman. Back at their hotel, Jigen also comes under attack by a couple of assassins. 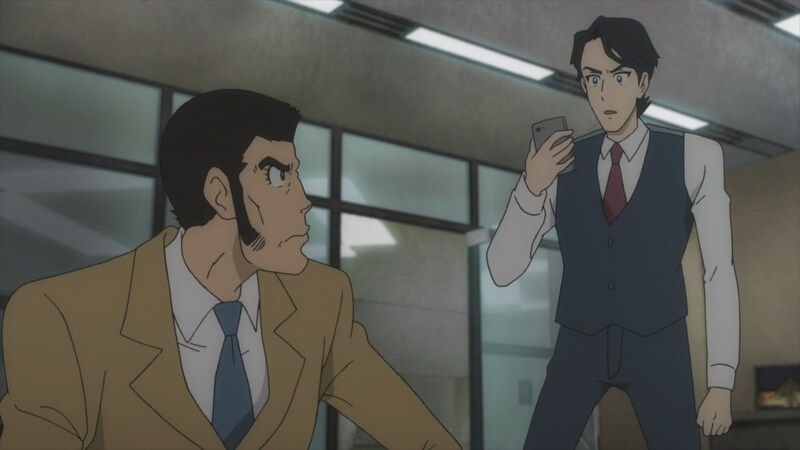 Meanwhile, Yata shows Zenigata a website that allows people to bet on when someone will die, in this case, Lupin. Zenigata realizes that a hit is out for Lupin. Back in Bwanda, Lupin is trying to get Ami to safety, but runs into several more assassins. 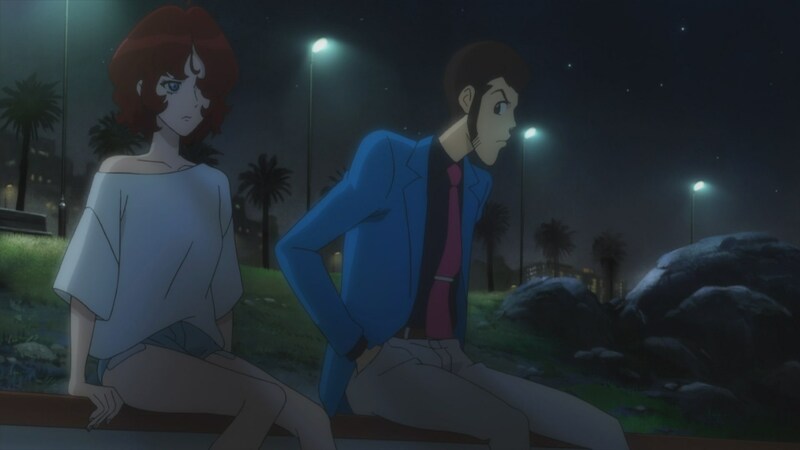 Due to having to get a lot of work projects done before I hit the road this weekend, I didn’t get to watch Lupin the Third Part 5 – 02 as soon as I wanted. But, now that I’ve got a window, I have watched the episode and like where things are going. There are several elements that are key to any Lupin III story. 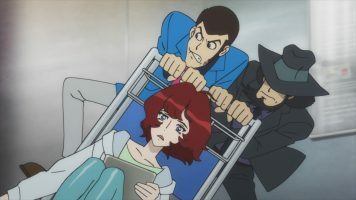 One of them is Lupin escaping Zenigata or other persons trying to nail him. The other is “Lupin Physics,” whereupon Lupin and company do things normal people could never do. Sometimes this goes way over the top, such as in Lupin III: Castle of Cagliostro. But it is funny. In Lupin the Third Part 5 – 02, we see Lupin Physics in action, only not so over the top. Nevertheless, it still ended up being quite funny, mainly because of Ami’s reaction to them using the wall to elude Zenigata’s forces. When Lupin stole an electric car, my first thought was, “Oh great. We are going to get some stupid religious lecture on the environment.” After all, there’s no way an electric car is going to be worth jack if one is trying to elude law enforcement. Thankfully, there was no preaching, but just a couple of jokes. Further, there was a good story reason to steal the electric car, namely to get the AW609 vertical takeoff airplane started. As such, the scene goes to show how brilliant Lupin is in planning his moves like a chess master. It is not unusual for Lupin to get involved with young women and girls. Most of the time, he does have some sort of attraction to said girl, even if he decides not to act on it. With Ami, I hoped the writers wouldn’t go down this road. Fortunately, they addressed the issue head on by having Ami ask why Lupin wants her around, even asking if its because he wants her for sexual purposes. His vehement denial was enough for me, so that should be it for any potential Ami x Lupin romance. Lupin’s reasons for keeping Ami around are in line with his actions in the past. So I do believe he wants to keep Ami safe from Marco Polo. At the same time, it doesn’t hurt to have an ace hacker on your team. I need to get this review of Lupin the Third Part 5 – 02 wrapped up so I can get some other things done before crashing tonight. I’m not sure I’m a fan of all of these assassins coming for Lupin and company. It isn’t the idea of assassins looking for a massive payday, but rather the weirdness attached to each assassin. They are all way over the top and come off as clownish in nature. I like that Zenigata isn’t just some buffoon for comic relief. Any other criminal would have been nailed by Zenigata. Lupin got away because he’s always thinking moves ahead. Fujiko only scored a cameo. I wonder if the assassins coming for Lupin brings her into the action. 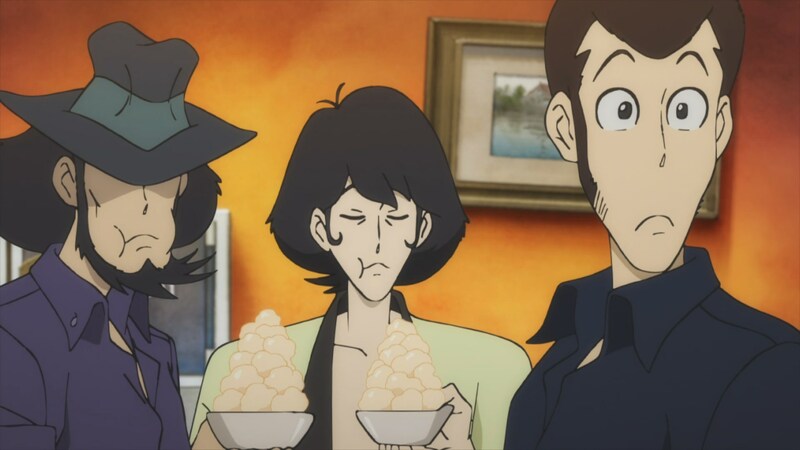 In the end, Lupin the Third Part 5 – 02 was an enjoyable episode, though the assassins are a bit much. I’m really looking forward to seeing where things go. LOL, have you ever read about the Tesla cars? They are even used by some police forces. Yeah, but mostly for show and to say, “Oh, look how we care.” Some police officers aren’t that keen on them for police work. That aside, if Lupin were trying to get away by vehicle (which he has done in previous series), an electric car is only going a little over 300 miles and then that’s it, whereas a gas/diesel car just needs a quick refuel and it is back on the road. I heard that Yata’s gun was sliced up by Goemon in this episode. I don’t remember a gun being sliced. I’d need to rewatch the episode.